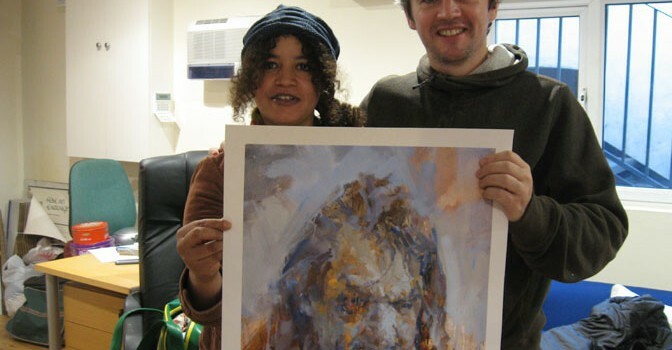 A few months ago John met Pat who was attending a day centre in Camden Town. Pat comes to the centre a couple of mornings a week to use the shower there. Workers at the centre had tried to engage with Pat to find out his housing status etc. but Pat never had any engagement with the state in all the years he had been in London since he emigrated in the 1960’s and he wasn’t about to change his ways now. Pat had been one of the hundreds of thousands of men who came to England from Ireland in search of work. In those days many of them worked exclusively on a cash-in-hand basis: contractors paying workers in lump sums, avoiding tax in a system of exploitation which became known as ‘The Lump’. Slowly John managed to gain Pat’s trust and learned that he was from Limerick and hadn’t been home in decades and eventually Pat decided that he would like to go back to Ireland with Aisling. One aspect of Pat’s non-compliance with state institutions meant that he was not registered with a doctor so John persuaded him to see the homeless practice on Hampstead Road and in particular a doctor we have had a lot of contact with recently because of his patience and respect for homeless clients. The doctor was concerned about Pat’s health and referred him to the UCH for tests. To date about 6 appointments have been made for Pat and he has missed them all. It is really slow going which is not surprising given Pat’s history of casual labour and even more casual housing. Pat, as far as we can tell is sleeping rough, possibly in Islington and possibly near Sainsbury’s in or around the car park and quite likely sometimes in the public toilets nearby. We are particularly worried about his health giving his precarious living conditions. The doctor felt that a supported trip to Ireland could only do him good not least because he would be eating regularly and healthily and he would be sleeping in a bed every night for a week. There are options for Pat to obtain some form of housing in a hostel or even a cold weather shelter as some of these stay open in the better weather months and his age would make him a priority with Islington homeless persons unit but of course his current status would have to be verified for the system to operate and Pat is not ready to do that yet. We were hoping that the trip to Wicklow we are planning for early September might be the trigger for Pat to come out of the cold. So this is the most delicate of times in our relationship with Pat and we need to be very circumspect in our dealings with him. He has already made a big move by agreeing to see a doctor and although he has missed several appointments at the hospital he is at least contemplating attending, with John’s support, and John has turned up for each of those hospital appointments Pat missed. It is hard to imagine quite how big a deal it is for Pat coupled with the fear he is feeling now that he is aware that his health is failing. Our only point of contact with Pat has been the day centre in Camden and they have a duty of care to the men and women who attend the centre so as Pat has started to open up to Aisling they have tried to get more information from him. Around the time when we were preparing clients for our trip to Wicklow and working more regularly with Pat, meeting him sometimes at a coffee shop on Camden High Street as well as the day centre, he disappeared. He may have been feeling nervous about the trip although he was always more than enthusiastic and certainly seemed to be looking forward to it. Perhaps our close attention and that of the day centre who were raising safeguarding issues with Pat which necessitates a lot of forms filling, meetings and general bureaucracy that Pat had spent a lifetime avoiding, had all gotten a bit too much for him. Anyway as we didn’t see him for two weeks before the trip and as we had no way of contacting him he had to be dropped from the short list a week before the trip and someone was found to go in his place. Since we have returned from the trip Pat has reappeared and John is back reengaging with him for the next trip in December. By then it may be so cold he might be glad of a bed in Ireland for a week, if he survives that long. His is an old story for Aisling and for each of our 5 trips a year we always have several drop outs but we doggedly maintain our contacts with the most vulnerable Irish men and women In London knowing that eventually our persistence will bear fruit and an intervention with someone like Pat can have hugely positive consequences for his life and his state of mind. Actual street homelessness is increasing these days and can happen without warning to many people who would never have expected themselves to ever be in that position. Take for example a woman in her 40’s with a husband in a good job and a home whose relationship breaks down and finds herself on the streets then in a shelter sharing a room with others who are just as unfortunate but maybe more able to cope after a harder life of their own. Something like this can happen to anyone as it happened to Theresa whose life fell apart one day and was never put back together again. She is from Wicklow and wants to go back to Ireland for a break from her current circumstances but she is not yet ready to visit her home town. Another of our returners this trip is Billy who has recently suffered the death of his partner and eviction from the flat they shared for 18 years. Until he lost her Billy was too shocked by grief to consider his own situation as a non-leaseholder on the flat and then to find himself homeless was a double shock to the system. He couldn’t argue the case with the council because they were cohabiting and receiving separate benefits and to reveal his circumstances would have led him into murkier waters as far as the benefits agency and the council were concerned. Billy is from Dublin and as such is looking forward to visiting his home town and checking out the changes to the city he grew up in as well as taking a break from his present worries. Mary was reunited with her sister after they lost each other when the family broke up and they were placed in separate homes. Since then her sister has raised a family in their home town of Dublin. As a child Mary was taken from Dublin to an institution in Kilkenny where she was looked after by nuns and her sister went to a similar place in the West of Ireland. Aisling has kept the sisters in touch over the last few years, Mary coming with us on our Wicklow trips and staying a few days in her sisters family home in north Dublin. This was their only point of contact as the sister was too ill to leave the house and although Mary is also feeling the effects of her age and a troubled life she has been able to make the journey with Aisling so far. This year Mary’s sister died and Mary is going back with Aisling to visit her sister’s home for the last time as it will be returned to the corporation soon. She has loving nieces and other family members who will make the few days very pleasant for her. Garry suffers with mental health issues and has been with Aisling on a couple of occasions to visit his family home in Mayo. The home is an abandoned cottage in a very isolated part of the county. Garry was the only family member who wanted the cottage but didn’t inherit and the property passed to a distant cousin in England who has no interest in it but doesn’t want to give up her rights to the property either. When in Mayo with Aisling Garry would visit neighbours that he remembers from his childhood and stay in a local guest house but in recent years he no longer finds this arrangement satisfying but he still gets a lot of satisfaction from trips to other parts of Ireland with Aisling. Recently it has come to light that Garry has a live-in lodger in his flat in Camden who seems to have attached himself to him somehow. He is a foreign national without leave to remain in the UK and he stays with Garry and kind of looks after him, cooking and cleaning the flat etc. This seems to have been a suitable arrangement but lately Garry has found that his income support and disability money is not going as far as it used to and he is contemplating a move to Liverpool where, in his own kind of logic he believes everything will be cheaper than London and he will be able to have a better quality of life. We think that maybe a trip away for a week could help to give Garry some perspective on his situation. Big Brendan was one of our first reserves and was happy to step in to cover for one the 4 who had dropped out in the last week including Pat. The others were all in one way or another feeling nervous about returning home and found other things to do that week which were of more pressing importance like doctor’s appointments and signing on, all of which had already been put back till after the trip but sometimes people are not ready and we have come to expect that and there are always other trips for when they are. Brendan didn’t turn up on the morning we were leaving for Holyhead and wouldn’t answer his phone until later when we were further down the road and he called to say that a friend had come around to take him to the minibus pick up but instead took him down to the coast for the day. Later we found out he was on a bender and had to be booked into a detox when we got back. We managed to leave London in our minibus with plenty of time to get to Holyhead for the ferry at 2.10pm but with the amount of speed restrictions now on the M1, M6 and M56 almost half of the journey is 50MPH max and we were the last to arrive at the ferry port and had to drive straight on in time for a smooth and pleasant crossing. We arrived at Avon Ri (http://static.ie.groupon-content.net/30/55/1352304025530.jpg) and got some shopping in and settle down for a relaxing evening after our exertions on the road. The next day we were feeling refreshed and went out in search of spiritual sustenance (well, some did) and they were an hour late for mass but we expect that they will be forgiven on the day Mother Theresa becomes a saint. I am reminded of the heart wrenching ballad Elton John wrote in honour of Mother Theresa when she died: ‘Sandals in the Bin’. We had a very good Sunday lunch at Avon Ri where we watched the All–Ireland Hurling Final between Tipperary and Kilkenny. For the first half it was Tipp for Cat with nothing to separate the two teams until Tipperary proved the stronger and won by 9 points. They also proved to be champions at cursing in the post-match interview and I hoped Saint Mother Theresa wasn’t listening in. We had two birthdays and presented our own Theresa with something useful to help her enjoy the week with Aisling. Later Paul was looking a bit put out so we gave him his present early as he was heading off to Mayo on Tuesday. 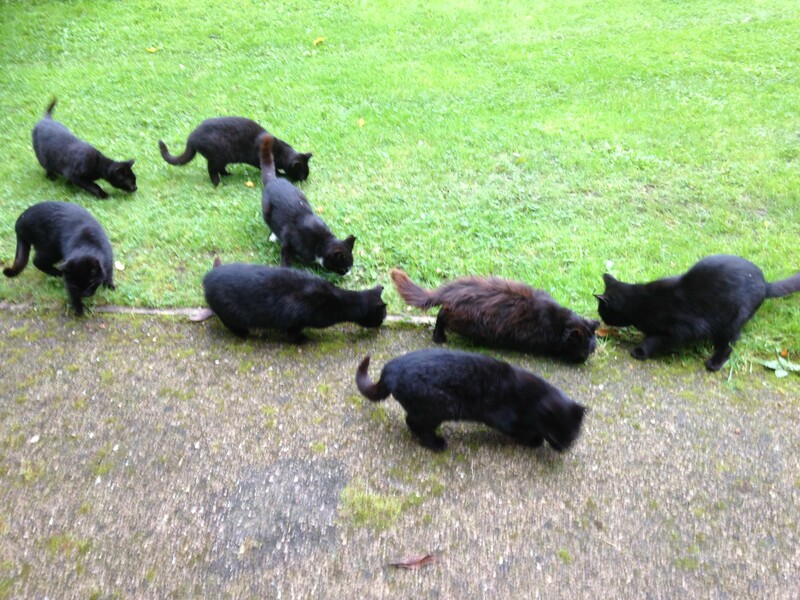 By day scary Northumbrian outreach worker by night Charlie turned into the Cat-woman when she found seven young stray cats in the bushes next to our holiday cottages. First the slices of ham we had bought to make sandwiches went and soon we were buying cat food for them. ‘I love them all’ she said. We headed out for a drive and it turned into a marathon cross-Wicklow rally. We had tried to find Johnny Foxes (https://upload.wikimedia.org/wikipedia/commons/f/fb/Johnnie_Fox’s_Pub,_Glencullen.jpg pub before without any luck but this time we were determined and after a few bad turns due to dodgy signage we found the fabled pub and enjoyed a pleasant couple of hours wandering through its many rooms filled with fascinating artefacts, pictures and stories adorning the walls. Later we made our regular pilgrimage to Glendalough (http://i1.trekearth.com/photos/5513/glendalough_monastery.jpg) and marveled at St. Kevin’s round tower from where he cast down the young woman who brought his meals for daring to be too attractive and tempting the old hermit. I wondered how he would have treated his fellow saint Mother Theresa if she had passed by his hideaway. We had a long walk on Brittas Bay in beautiful sunshine and on the way home Charlie noticed the local pet hospital in Blessington and arranged for the cats to be checked out and neutered. I made a note to take a leaf out of St. Kevin’s book if she ever gets too fond of me. We spent Tuesday in Dublin, partly at the National Museum (http://static.squarespace.com/static/518ee9e6e4b02c1428e17e12/t/51d86d3ee4b033e178dcb22a/1373138256809/Gold_Broighter_Ireland.jpg?format=1000w) where we had lunch among the many artefacts of ancient Irish civilisation and in the afternoon went to see the grounds around Dublin Castle where there are magnificent gardens of remembrance that none of us had any memory of although most of us had spent a lot of time in the city over the years. Billy is a native of Dublin but had never ventured too far from his home around Smithfield where he ran wild in the streets in his youth and sold papers on O’Connell Bridge but most of the city remained a mystery to him. While we were having an ice cream in tourist-crammed Temple Bar he told us about an incident when he was a young lad in the 60’s and had stolen a badge from a stall on Liffey Street just over the Ha’penny Bridge (http://cdn6.bigcommerce.com/s-eb0e0/product_images/uploaded_images/ha-penny-bridge-and-river-liffey.jpg?t=1429199958) near where we were standing and was chased by the stall holder over the bridge and into the warren of lanes, flats and factories that made up Temple Bar in those days. He thought the man would give up after a while but he didn’t and he kept after him until Billy was completely lost. He eventually shook off the angry stall holder by hiding in the entrance to a block of flats while the persistent stall holder roamed around seething. At last the man gave up and Billy emerged shaking and scared. Somehow he made his way to the river (where he got rid of the badge) and home but never ventured into this part of Dublin again, until today. We had dropped Susan off on the way into town at Cabra where her mother still lived between two huge catholic churches, Our Lady Help of Christians and The Precious Blood and Sean and Paul were put on the train to Westport from Heuston Station on our way out of town where they both would be visiting their families until Friday. We had parked along the railings of Trinity College in the coach park and we had arranged to meet back there as some of the group wanted to explore the city in their own way. Garry had gone off alone as soon as we arrived and was nowhere to be seen at the appointed rendezvous time. We were a bit worried because he is vulnerable and could easily get lost and it seems he had switched his mobile off, ‘saving the battery’. After 20 minutes waiting Charlie decided to phone Pearse Street Garda Station to ask them to keep an eye out for him. She was giving a description when she asked me what Garry was wearing. I was struggling to think when I heard her say to the guards, ‘a blue checked shirt and purple trousers’ before cancelling the APB. She had spotted Garry hurrying towards us pushing tourists aside. He had jumped on a bus as soon as he left us and it took him to Blanchardstown for the day. The one thing he had wanted to do was travel on a Dublin bus and have a coffee at a pavement café which he found in the recently Tigered-up streets of Blanch. We took the pretty route back to Blessington over the Sally Gap and spent the evening enjoying Charlie’s apple crumble. 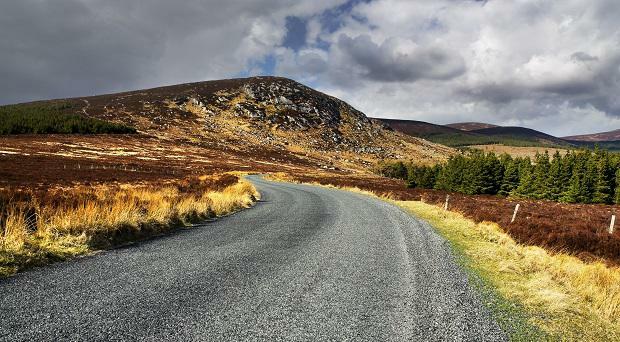 It seems that if you want to get anywhere in Wicklow you will have to go through the Sally Gap http://cdn-04.independent.ie/incoming/article34820183.ece/019ef/AUTOCROP/w620/Sally%20Gap%20Wicklow.jpg) at some time. It is high, windswept and as rough a road as you will find anywhere in Ireland. It was built as a military road to allow the redcoats into the mountains in pursuit of the rebels of the 1798 Rising including Michael Dwyer and Billy Byrne who were hiding out in the hills. When they were eventually caught the rebels were locked up in Wicklow Gaol before being transported to Australia. All this and much more you can find out at the Gaol museum (http://heartofirelandtours.com/sites/default/files/wicklow%20gaol.jpg) which is well worth a look if you are ever in the area, evading redcoats or otherwise. As part of the tour there is an introduction from a charming lady dressed in period costume who will also sell you a souvenir pencil or cuddly toy from the gift shop as you are leaving. There are loads of interactive features including torture, execution and ghosts. Since our last visit to Wicklow town it has undergone a major face-lift and the change is startling, the whole town seems to have benefitted from it and there is a palpable buzz around that was missing only 6 months ago. We had another walk on Brittas bay for ourselves, this time under grey skies but it is good for the soul in any weather. That evening we went to the West Wicklow House in Blessington for a ballad session that had us singing along to the usual Christy Moore and Dubliners songs. On the way into the pub the local bar stool wit called us the Addams family under his breath. Bloody cheek we are the Shoot-Up Hillbillies. The Straycats are looking a whole lot healthier; they are almost fat cats now. We’ve been giving them cat food in brown envelopes and they are wearing pin striped suits rather than cowboy shirts and skinny jeans. Charlie Cat-woman has now turned her attention to the crow population. ‘I love them’ she now says of the crows, god help the crows. We had business to do in the city of the cats today and spent a few hours enjoying the very lovely town of Kilkenny. The Smithwicks brewery is no longer in operation, except for the inevitable gift shop, or the beer festival but the Cat Laughs comedy festival and the Rhythm and Roots festival are both thriving. We had a posh lunch on a starched table cloth in the dining room of the Hibernia Hotel (http://www.kilkennyhibernianhotel.com/cmsGallery/imagerow/8965/resized/1900×900/kilkenny_hibernian_hotel_6492.jpg) and explored the town. The buzz on a drizzly September Wednesday is impressive as is the laid back vibe along Kieran Street where we were entertained by a sweet voiced teenaged busker who will probably sound like Ronnie Drew when his voice breaks anytime soon. In the Stone House bookshop I was helped to find the book I was looking for by as very clever young woman who found it without me knowing the title or the author. It turned out to be Red Dirt by EM Reapy and was recommended to me by a friend who is a cousin of the author and Martin Doyle, the assistant literary editor at the Irish Times. It lifts the lid on the often desperate (cat melodeon) Irish emigrant experience in Australia and is well worth a read unless you have a young son or daughter out there (https://www.goodreads.com/book/show/27912711-red-dirt ). Isn’t it strange how the same bad habits and exploitation follow our emigrants of every generation even to the other side of the world? One of the charity shops was still displaying hurley sticks and Kilkenny colours in the window and we were informed by the very knowledgeable Latvian shopkeeper that the county was still in the Camogie final in a couple of days’ time. On Friday we followed another chapter in the inspiring story of Michael Dwyer and the men of ’98. South of Blessington on the N81 take a left towards the Glen of Imaal and behind a solitary farm house there is a lane up to a perfectly old-style thatched and whitewashed cottage. This is where Dwyer and his rebels were ambushed by the redcoats. Samuel McAllister was already injured and knowing he couldn’t get away he stood at the door of the house to draw the soldier’s fire so that Dwyer and his men could escape out the back. This was in1799 and the Dwyer gang remained on the run in the mountains for a further 4 years. Later we visited Russborough House, (http://visitwicklow.ie/wp-content/uploads/2015/02/russborough-house.jpg) a much more substantial building and the longest Palladian-style house in Ireland which was occupied by Dwyer and his rebels and later by the British forces on his tail. There is very little left of the magnificent parquet flooring, only in the salon sadly as it was dug up by the redcoats to use as sentry boxes. But there is an abundance of original features and as they say on the telly location is everything and there are breathtaking views across Blessington Lake to the Wicklow hills. Russborough is a fine place to visit on a rainy day with a very knowledgeable guide for company and the stories of the two major art thefts by Dr. Rose Dugdale and the IRA in the 1970’s and by The General in the 80’s are worth the price of admission alone. After the magnificent tables of Russborough laden with bone china and silver cutlery we ate our final meal in Wicklow bought from the Italian chipper in Blessington out of paper and on our knees. That evening we collected Susan from her mother’s house in Cabra where we sat for a while in the cozy lounge drinking tea and chatting about all of her mother’s many activities that keep her so young looking, like the local choir and her rather good paintings, lucky The General’s not around these days. We picked up our Mayo men from Heuston station a little bit merry after their homecoming celebrations continued on their last leg to Dublin. We were up bright and early on Saturday morning and as we prepared to leave some of the men smoked a last cigarette outside the van ignoring all calls to get in so we could get on the road to the ferry port. Then Charlie’s voice, invoking the spirit of her friends the crows in nearby trees barked a final order and they hurriedly stamped out half-smoked butts and jumped into the van. We headed for the ferry from the North Wall then across to Wales and on to London riding the horse we rode in on. We are saying goodbye to the cats and crows who have been our constant companions since we arrived in Wicklow and when we reached London a fond farewell to all of the friends we brought with us to Paddy’s green shamrock shore.